Silent films aren’t so silent after all at the 4th International Silent Film Festival. 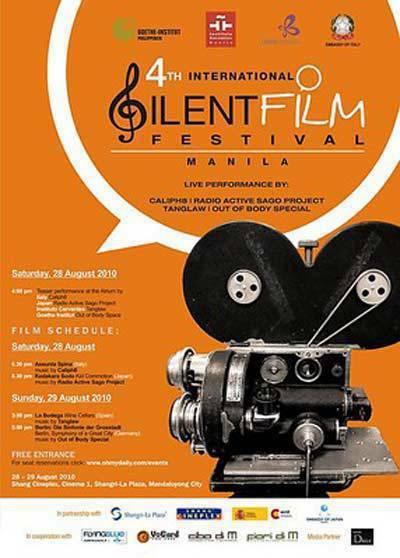 The Goethe-Institut Philippinen, Italian Embassy, Instituto Cervantes, and Japan Foundation collaborate once again for the 4th International Silent Film Festival which will run from August 28 to 29 at the Shang Cineplex Cinema 2, Shangri-la Plaza Mall, EDSA, Mandaluyong City. 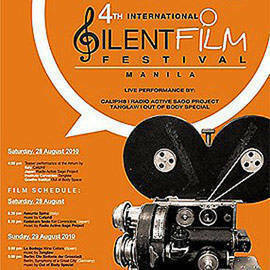 Billed as "the only silent film festival in Southeast Asia," the festival will feature silent films from Germany (Die Sinfonie Der Grosstadt/Berlin, Symphony of a Great City), Italy (Assunta Spina), Spain (La Bodega/Wine Cellars), and Japan (Kodakara Sodo/Kid Commotion) that will be scored live by Filipino bands--Out of Body Special, Caliph8, Tanglaw, and Radio Active Sago Project, respectively. To see the schedule and synopses, click here.